Finger injuries are common and range from minor cuts to major damages to soft tissue (tendons and ligaments) and hard tissue (bones). If finger injuries are not treated properly, it can lead to permanent deformation and loss of function. This device will be available for purchase by people in stores for personal care as well as in traditional medical care situations to treat damaged fingers. 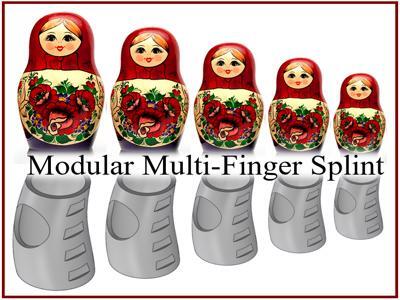 With the flexibility of modular assembly, this kit allows adaptability of care for any number of fingers, including the thumb. Finger rings, combined with the wrist gauntlet connection system, immobilize all the joints of the fingers and thumb, as well as position the phalanges bones in a functional resting position to promote healing.